India's former President APJ Abdul Kalam celebrated his 80th birthday by planting saplings along with hundreds of children and farmers at Nandangarai near Coimbatore on Saturday, 15th October. "This is the first time I am celebrating my birthday in a grand but unique manner, that too in the company of children," Kalam said, after cutting a cake. While addressing a group of students , Kalam hoped that he would touch a century so as to witness the might of today’s youth. “If I complete 100 years...if I am alive, then I will be seeing many of you walking on the Moon and Mars. Hold on to your dreams to reach your goals. Never give up. Will you?” he said. Kalam started asking how many of them wanted to become doctors, engineers and IAS officers. And, he had an extra option for the youth as he asked how many of them wanted to become entrepreneurs. “In the last one decade, I have met about 12 million youth all over the world and their power and capabilities never cease to surprise me,” said APJ Abdul Kalam. Read below some snippets from his speech. - The year 2011 is declared by UN (United Nations) as "International Year of Forests". - Everyone should plant and grow atleast one tree if he wants to be a human being. - The desire for flying will guide you to achieve great Goals. - You will win by your hard work and knowledge despite who you are now. - The history has separate page for everyone in the world. It is upto you to make the world to read your own page. - You should keep your individuality while the world is trying to make you to act as someone else. - Education Institutions should encourage the students to grow their research skills and thinking skills. - The true growth of India depends of the growth of villages where 70% Indian population live. PURA (Providing Urban Amenities in Rural Areas) will help to achieve the growth of villages. Four "connections" are required to achieve the goal for providing urban facilities in villages. First connection is Roads connecting the villages, second connection is "Telecommunication", third one is knowledge related connections. If we integrate all these three connections, the fourth connection "Economic" connection will be created automatically. - "Good Character" is the fundamental thing for achieving success in any thing. You can learn "Good Character" from your Mother, Father and Teachers. 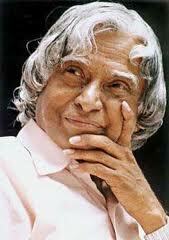 Abdul Kalam was born in Rameshwaram, Tamil Nadu, in India on 15th October 1931. During his term as India’s President, he was popularly known as the People’s President. People especially Students love and respect Kalam so much. Kalam has proposed a research program for developing bio-implants and Space solar power. And, he is a supporter of Open Source (e.g LinuAbdul Kalamx, Mozilla FireFox, php, apache) over proprietary solutions and believes that the use of free software on a large scale will bring the benefits of information technology to more people. And, he is doing teaching and research tasks. Above all he took up a mission to ignite the young minds for national development by meeting high school students across the country. His book ‘India 2020′ highlights the action plans that will help develop the India into a knowledge superpower by the time 2020. And, his poems and Quotes inspire young minds. Find below some of his Motivational Quotes. APJ Abdul Kalam mentions in his biography that to support his studies, he started his career as a newspaper vendor. Daily early morning he used to go to Rameshwaram Road Railway Station, three kilometers away to collect News Papers after finishing his tuition. You can follow @official_kalam to get tweets from Abdul Kalam. A P J Abdul Kalam is planning to visit all nuclear reactors across coastal belts of India and hold discussions with the scientists in the wake of growing protest against the upcoming nuclear plant in Koodankulam in Tamil Nadu. He was asked to comment on the ongoing protest by people at Idinthakarai village against the Koodankulam Nuclear Power plant. He said nuclear power is clean energy and the nation can achieve energy independence by tapping it. And, He said that he would comment on the nuclear safety issue after 10 days once after getting the details regarding the nuclear installations in India. Watch the below videos showing Poems written by Abdul Kalam.